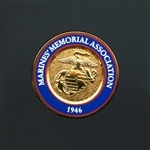 Lapel Pins: Marine Flag, Globe and Anchor, Navy, Army, Coast Guard, Air Force. Assorted set of 8 blank notecards. The MARINECLUB Bullies have greeted members and guests at Marines Memorial for the last 15 years. Bravo Zulu is a naval signal, typically conveyed by flaghoist or voice radio, meaning "Well Done"; in addition to U.S. naval forces, it has also been used as part of vernacular slang within NATO and other Allied naval forces. Beautiful art print of the Marines' Memorial Club on Sutter Street in San Francisco on a typical fall or winter's rainy day. Light and dark hues of brilliant color. 11" x 13"
A beautiful rendition of our art print on a custom shower curtain. Top quality fabric and dyes. Machine washable. Will not fade. Deluxe 70 x 75 inches.